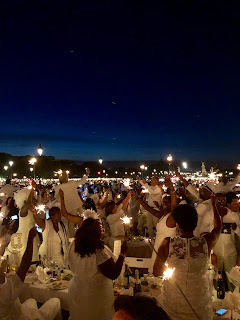 One of the main reasons my Mum and I went to Paris was for Dîner en Blanc - which seems a little crazy, but if you keep reading you will see the amazing time we had and why this night is so unique! 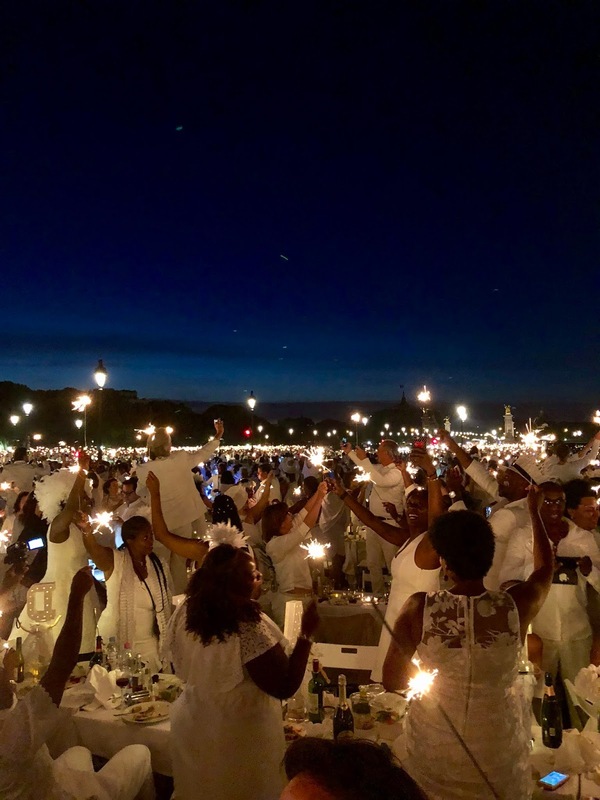 "Dîner en Blanc is a worldwide event, spanning six continents, in which people gather in a public space and set up a temporary, chic dining area. Guests come dressed in white to enjoy quality food and wine. 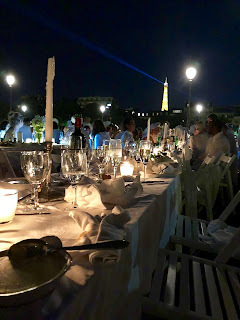 Diners are required to provide their own food, tables, chairs and tablecloths. 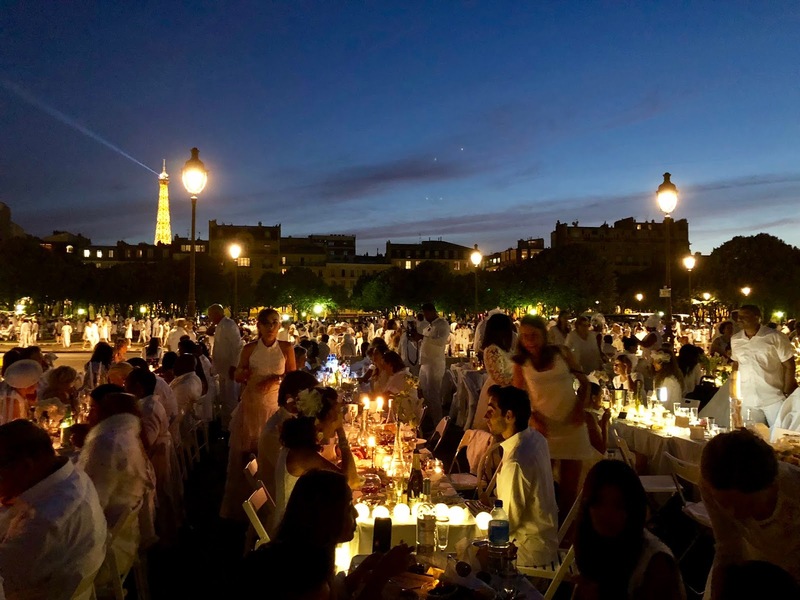 Only a select number of participants who have previously signed up are made privy to the location the day of the dinner, and generally converge in an iconic city location." This also happened to be the 30th anniversary of Dîner en Blanc, which made the event even more special. 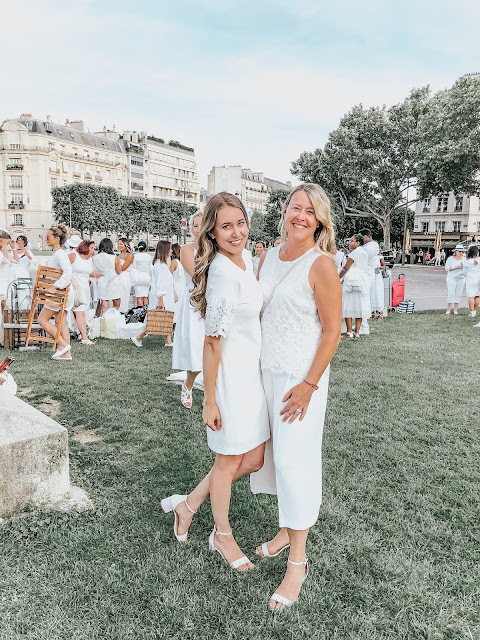 How did we end up at Dîner en Blanc in Paris?! I love the concept of Dîner en Blanc, so while looking out for the Toronto Dîner en Blanc, I came across the Paris event. I registered thinking there was no way that we would get a chance to go, but closer and closer to June, it started to become a reality. When I was almost positive I had the tickets, I said to my Mum, Is there any chance you'd want to go to Paris for this event?! The rest is history. I am planning, at some point, to write a blog post about our entire trip to Paris, but I wanted to share about this event first! 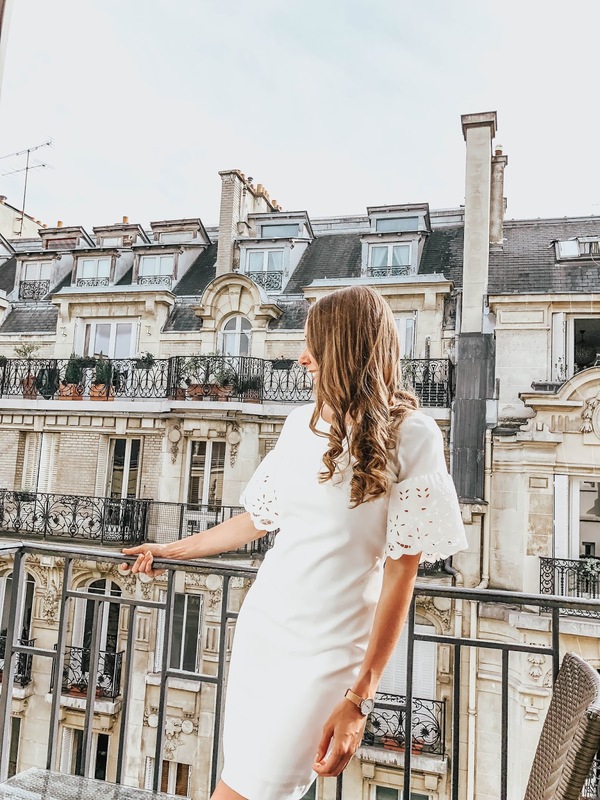 Thanks to my partnership with Hudson's Bay, I had a gorgeous dress to wear, which is still available here. 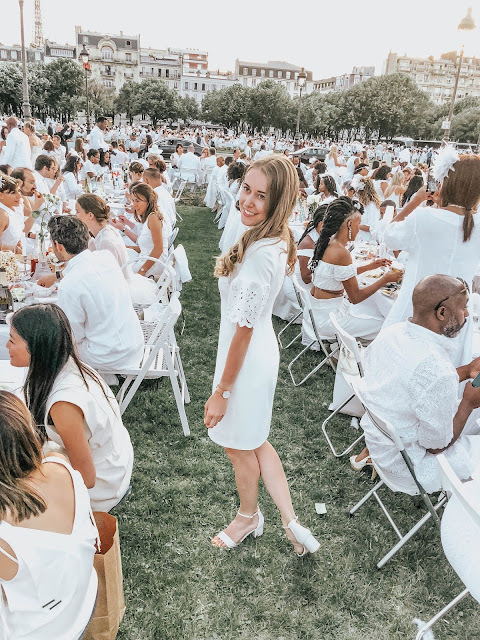 We travelled all the way from Toronto, with only our white outfits planned, and had to buy a table, two chairs, china, tablecloth and all of our food and drinks for this event. Then, take the metro to a meeting spot, and walk up to 20 minutes to the surprise location! My Mum and I at the meeting spot, waiting to find out the location. The secret location, after a while of walking, ended up being Esplanade des Invalides, Rue Fabert, Paris, France. 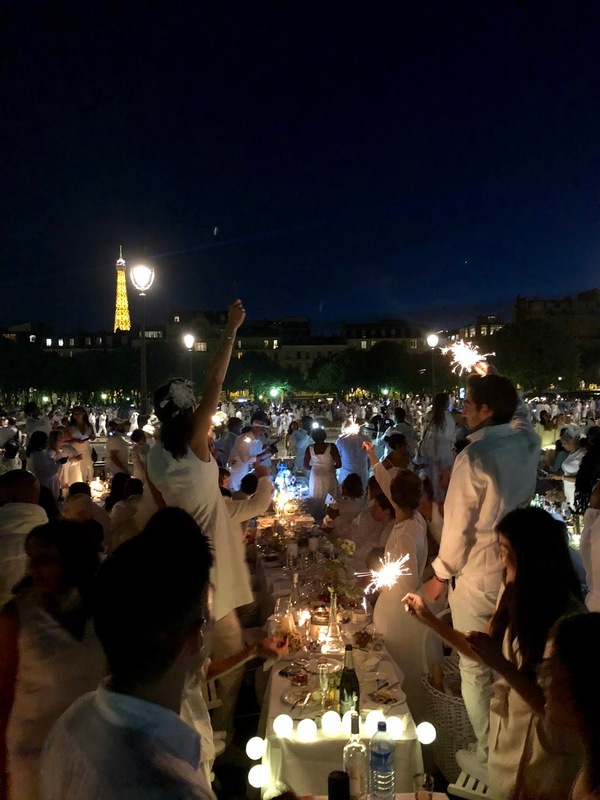 We were able to watch the sun set and the twinkling Eiffel tower lights turn on while enjoying the company of strangers and the food and drinks we brought. I recently started watching the YouTube channel Yes Theory, if you haven't heard of them, you should check them out - but something they have said a few times in their videos is that strangers are friends you haven't met before. 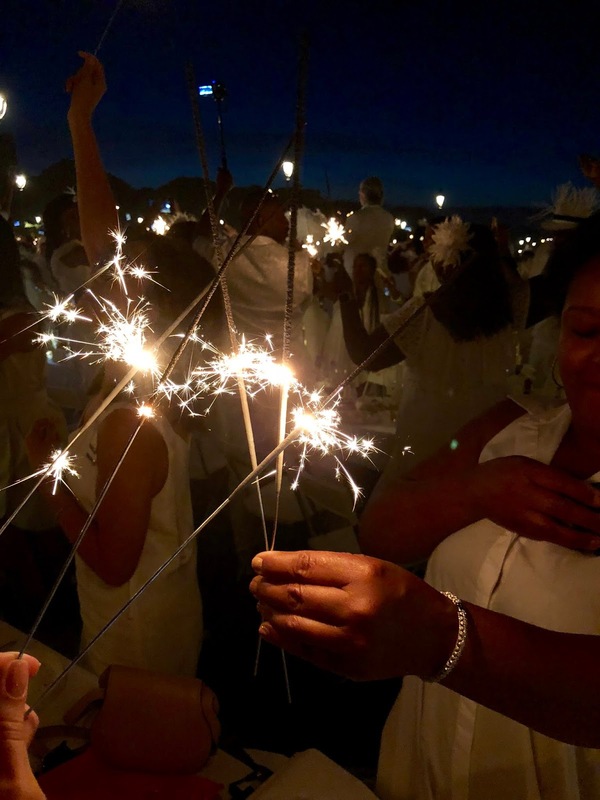 This was definitely the case with Dîner en Blanc, as we were surrounded by strangers who soon became friends and made the night incredible. 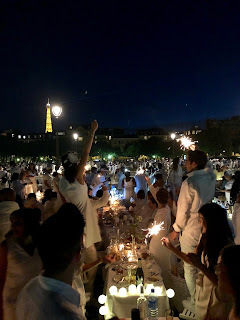 If you ever have the chance to go, it is really a fun and unique night, and I would definitely recommend it! Below are some of my favourite photos from the night, and there are some videos posted in my Instagram Story highlight "Events", which you can see here.